THANKSGIVING is traditionally the busiest day of the year on America’s roads. But this year, traffic might be a little lighter and the congestion may end a little earlier than in previous years. Thanksgiving travellers can give thanks to growing political discord for that. As Republicans and Democrats grow further apart, bipartisan turkey dinners are being cancelled or shortened—one sign of the way political rancor is spilling over into into everyday life. Political scientists disagree over whether the electorate’s policy views have diverged, but there is no question regarding their views on the party they oppose. The proportion of Republicans and Democrats who reported “very unfavourable” feelings towards members of the other party climbed from around one in five in 1992 to above one half by 2016 according to Pew Research Center polling. This mutual disregard has effects beyond politics. Research suggests party supporters asked to select one of two candidates for a college scholarship prefer declared partisans of their own party over opponents four times out of five. Similarly, presented with clues as to political affiliation, party supporters are more likely to rate their co-partisans as better job candidates and more attractive dates. In 1960, only about one in 20 parents reported they would be upset if their child married someone from the opposing political party; by 2010 that had climbed to one third of Democrats and one half of Republicans. And, according to Pew survey data, 64% of Democrats and 55% of Republicans report they have few or no close friends from the other party. A recent study by Keith Chen and Ryne Rohla of the Universities of California and Washington State, meanwhile, suggests partisan animus may also be cutting family gatherings short. The researchers used cell phone location data to track the Thanksgiving movements of 10m subscribers in 2016. That holiday took place two weeks after the presidential election that pitted Hillary Clinton against Donald Trump. The researchers were particularly interested in the movements of people who travelled from one electoral precinct to another in order to celebrate. Using precinct data on Republican and Democratic vote share, they calculated the relative likelihood that the people who were guests for Thanksgiving had voted for a different presidential candidate than their hosts.And they compare that likelihood with the length of time guests stayed at dinner. They found that Thanksgiving dinners more likely to include a mix of Trump and Clinton voters were between 20 and 50 minutes shorter than dinners that were more likely to have been purely partisan gatherings. If travellers came from a home media market that had been particularly saturated by political advertising, Thanksgiving visits were even shorter—by more than an hour for those from the most ad-saturated precincts in swing-state areas. According to Pew data, 39% of Americans reported that their family tried to avoid talking about politics during the Thanksgiving of 2016. 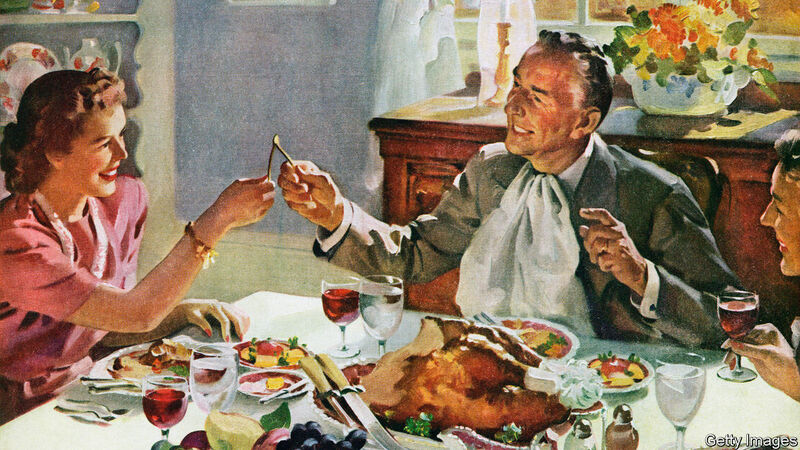 Mssrs Chen and Rohla’s research suggest that some combination of failing in that effort or paying the emotional tax of finding other topics to talk about shortened the length of Thanksgiving dinners by a total of 34m hours nationwide. Since 2016, the discomfort of cross-party dialogue has only grown: In October this year 53% of Americans said it was “stressful and frustrating” to have political conversations with those they disagree with, up from 46% in 2016. Perhaps a record number of Thanksgiving guests will be driving home this week before the pumpkin pie is out of the oven.